The Department of Defense and Library of Congress have blocked access to WikiLeaks from their computers. Washington (CNN) -- Unauthorized federal workers and contractors have been warned not to attempt to read the classified documents on WikiLeaks on either government or personal computers. The White House Office of Management and Budget sent a memo Friday afternoon forbidding unauthorized federal government employees and contractors from accessing classified documents publicly available on WikiLeaks and other websites using computers or devices like BlackBerrys and smart phones. The memo, sent to general counsels at various government agencies and obtained by CNN, explains that the publishing by WikiLeaks does "not alter the documents' classified status or automatically result in declassification of the documents." "To the contrary, classified information, whether or not already posted on public websites or disclosed to the media remains classified, and must be treated as such by federal employees and contractors, until it is declassified by an appropriate U.S. Government authority," the memo said. The memo does allow for reading of articles about the cables on media sites. OMB spokesperson Moira Mack said the memo "does not advise agencies to block WikiLeaks or other websites on government computer systems." "This is principally about protecting government IT systems," Mack said. She described the memo as a template for agencies to use as guidance, saying it "restates and reinforces existing restrictions on access to classified documents by unauthorized personnel or on computers that access the web via non-classified government systems." Asked if employees could lose their jobs if they access the WikiLeaks website on personal or government computers or devices, Mack told CNN, "Any breaches of protocols governing access to classified material are subject to applicable sanctions under long-standing and existing law." The State Department sent a warning to staff not to confirm the authenticity of any published documents and to refer all inquiries to the public affairs office. "The department is reviewing the material that has been made public. We take reports of the deliberate and unauthorized disclosure of classified material very seriously," according to a copy of the memo obtained by CNN. "The security and safekeeping of classified material and the safety of State Department personnel are our highest priorities." The State Department memo also reminded the staff that even though they are published, the normal standards for handling classified documents apply when viewed at work or home. "Any classification markings on the downloaded material should be retained. If such material is printed, however, it must be handled as a classified document and stored in a classified container," the memo said. 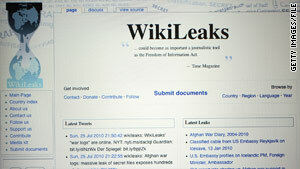 Separately, the Department of Defense and the Library of Congress have blocked access to the WikiLeaks website from their computers and instructed their employees not to read the documents published by the website, according to representatives of both agencies. "We have put out a policy saying Department of Defense military, civilian and contractor personnel should not access the WikiLeaks website to view or download the publicized classified information," Department of Defense spokesman Maj. Chris Perrine told CNN. "Doing so could introduce potentially classified information on unclassified networks. This creates 'spillage' which can result in a great cost of time, manpower and money." The statement echoes similar language in the Office of Management and Budget memo. Library of Congress spokesman Matthew Raymond issued a statement saying the library "decided to block WikiLeaks because applicable law obligates federal agencies to protect classified information. Unauthorized disclosures of classified documents do not alter the documents' classified status or automatically result in declassification of the documents." He said the block applies to patrons working in the library's reading room as well as Library of Congress staff. CNN's Jill Dougherty and Charley Keyes contributed to this report.